The RipRock dollarbies are on the left wall as you enter the store just under the group joiner. On the opposite wall to the right you’ll find a section of “Events.” This is also where you’ll find store associated group gifts such as the Fab Free exclusive group gift. This gift is free to all Fabulously Free in SL group members. Nevi showed off this RipRock freebie in her post “Junkyard Beauty.” If you’re not already a Fabulously Free in SL group member, have no fear, the Fab Free group is always free to join. Happy shopping, and enjoy the weekend Fab Free’rs! Categories: dollarbie (1L-3L), FabFree Group Gifts, Free, group gifts, mesh, other | Tags: dollarbie, fab free, Fab Free Designer Friday, Fab Free Designer of the Week, Fab Free in SL, fabfree, fabfree in sl, fabulously free in SL, FFDF, free, free group gift, free in sl, freebie, Riprock, RipRock Dollarbies, RipRock Fab Free Group Gift, RipRock Templates, Second Life, Second Life Dollarbies, Second Life Freebie Blog, Second Life Freebies, sl, sl freebie blog | Permalink. Hello Fab Free’rs, Happy Sunday-fun-day! I hope everyone has been having a good weekend. Mine has been great so far. Today I am so excited to tell you about the free August Subscriber gift from BYRNE. This gorgeous peacock feather print summer dress is this month’s free gift, and I can’t say enough nice things about it. The skirt is sheer from the upper thigh down, and has a hi-lo type look. I’m sure there’s a name for this type of skirt, but I am not up on my fashion terms. Maybe that’s a sign I need to have some intellectual curiosity here! So of course I wore this dress to the beach, the colors and the feathered pattern gave me some tropical summer feels. This peacock dress from BYRNE was sent out a few days ago to all Subscriber members. If you missed it just head over to BYRNE and click the subscriber. You might have to rejoin. Subscribers can be tricky sometimes, like anything in Second Life! ha The dress comes in several sizes and includes a head scarf not shown in the photo. Categories: dress, Free, mesh, subscribe-o-matic | Tags: beach, beach scene, Belleza Freya, Belleza Isis, Belleza Venus, BYRNE, BYRNE August Subscriber Gift, BYRNE Boutique, Catwa Koura, Clawtooth, Clawtooth Hair, Essences, Essences Blake, fab free, Fab Free in SL, fabfree, fabfree in sl, fabulously free in SL, Fashion Blog, Fashion Freebie, Fashion in SL, female fashion, free, Free Clothing in SL, free dress, free fashion, Free Fashion in SL, free gift, Free Gift in SL, free in sl, free subscriber gift, freebie, Indigo Poses, LODE, LODE Gladiolus, Maitreya Lara, Moorea Island, Nar Mattaru, Peacock, Prudence Rexroth, Second Life, second life blog, Second Life Freebie Blog, sl, SL Fashion Blog, sl freebie, sl freebie blog, Slink Hourglass, Slink Physique, subscribo gift, summer fashion | Permalink. Welcome back to the blog Fab Free’rs! Don’t mind Pru’s expression, she has resting b!$&# face. I’m really quite happy with the fabulous finds I have to share with you. I hope you like them too. For today I have 3 goodies, this summer hat and hairstyle from Pink Hustler, the gorgeous tattoo from This is Wrong, and this fun sundress from Continuum. 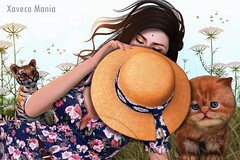 The Hair & Hat – A good hat hairstyle is sometimes hard to find in Second Life. This one had me at hello. It’s one of quite a few group gifts available at Pink Hustler. The gift comes with an “Essentials” color hud that also has some pretty pastel options. Additionally there’s a few color options for the hat. The Pink Hustler group has a steep one time join fee of 500 linden. I do however thing the abundance of gifts make the fee worth while. The Tattoo – This colorful tattoo reminds me of fractals and stained glass. I think I’ll be wearing it often! It is a free Lucky Letter board prize at This is Wrong. No group is needed to participate. There are 4 Lucky Letter boards at This is Wrong. Two have female tattoos with appliers for female bodies, and two have male tattoos with appliers for male bodies. This tattoo comes in several appliers with the option of regular and a faded version. The Sundress – The bright yellow and teal sundress Pru has on is the most recent Fabulously Free in SL group gift from Continuum. It comes in a few mesh sizes and is free to all Fab Free group members, just wear your Fab Free group tag, pay the vendor 1 linden, your gift will be delivered, and you’ll be refunded your 1 linden. If you’re not a Fab Free group member, the Fab Free group is free to join. Also, included with this cute little sundress is an alpha layer, so it is suitable for classic non-mesh avatars. Categories: appliers, classic avatar, dress, FabFree Group Gifts, fitted mesh, Free, group gifts, groups, hair, hats, Lucky Board, mesh, tattoo | Tags: Altamura, Belleza Applier, Belleza Freya, Belleza Isis, Belleza Venus, Catwa, Catwa Koura, Continuum, Continuum Fab Free Gift, Continuum Group Gift, eBody, Essences, Essences @Kustom9, Essences Blake, fab free, Fab Free in SL, fabfree, fabfree in sl, fabulously free in SL, Fashion Blog, Fashion in SL, female fashion, Female tattoo, Focus Poses, Foxcity, FOXCITY Poses, free fashion, Free Lucky letter Board Prize, group gift hair, group gifts, Hair with Hat, K9, Kustom 9, kustom9, Lucky Letter Board, Lucky letter Board Gift, Lucky Letter Board Prize, Maitreya Applier, Maitreya Lara, Pink Hustler, Pink Hustler Group Gift, Prudence Rexroth, Second Life, second life blog, Second Life Freebie Blog, sl, Slink Applier, Slink Hourglass, Slink Physique, summer fashion in SL, sundress, tattoo applier, This is Wrong, This is Wrong Lucky letter Board, This is Wrong Tattoo, TMP, TMP Applier | Permalink.